We were up and on the road at 6:10. I awoke during the night and have never seen as many galaxies as I could in the crystal clear sky. 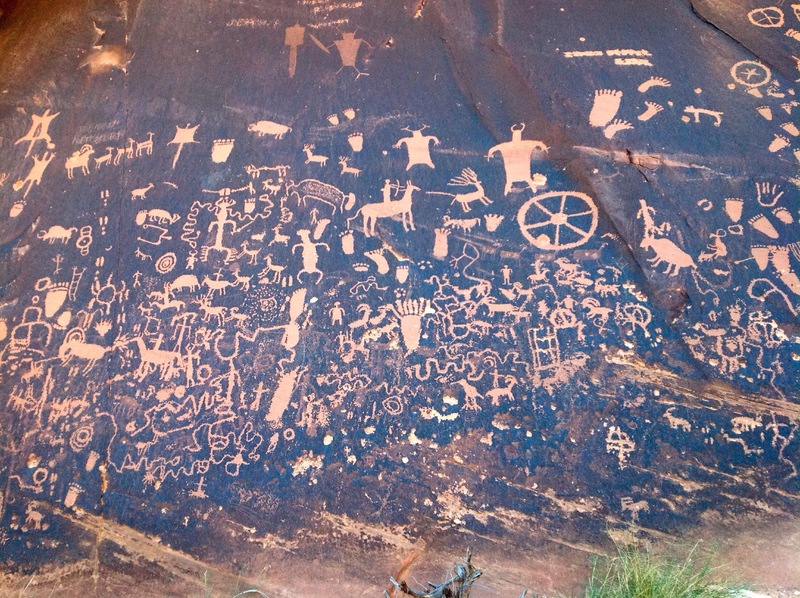 On the road out of Canyonlands and back to Highway 191 was Newspaper Rock. 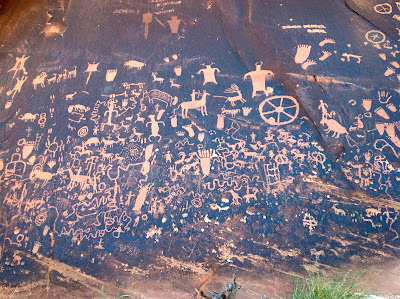 Newspaper rock is a petroglyph panel that records more than 2,000 years of Early Man's writing. It dates back from BC times to 1300. We arrived at Natural Bridges National Monument at about 10:15. The park was easy to see in a short amount of time. We hiked to one that was only a .2 mile hike. It seemed like it was longer, perhaps because it was heating up and going was all downhill. Leaving Natural Bridges National Monument we continued on The Trail of The Ancients to Muley Point where we would get a view of Monument Valley in the distance. Next on the agenda was driving down Moki Dugway. Once at the bottom we found a pull out and crawled in the back of the camper for a cool spot for lunch. 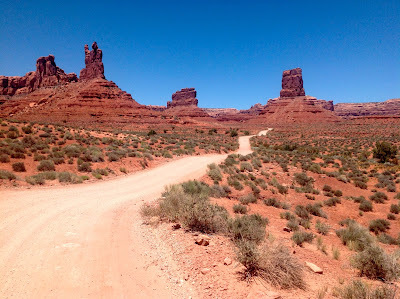 After driving through the Valley of the Gods we continued on to Bluff hoping to find a spot in a RV park. 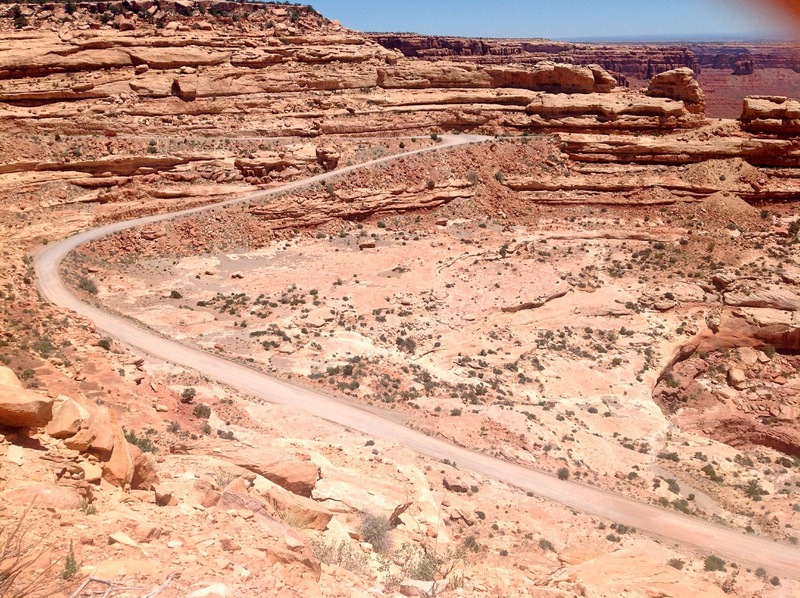 We arrived in Bluff, Utah and it was 102 degrees. 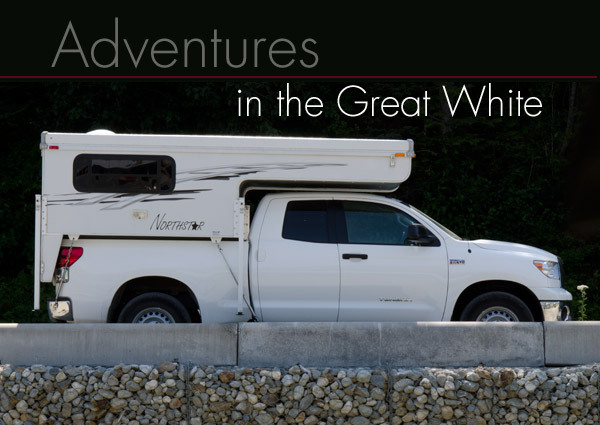 We found a shady, grassy spot at Cottonwood RV Park. Unfortunately, the shade didn't feel any cooler than the sun. We decided to stay in a hotel and enjoy their air conditioning. We had passed the Desert Rose and thought it looked good, so we drove back and secured a room. This was a great respite from the heat, the room was well worth the $117 we paid with AAA discount. We had a good dinner at the Bluff Diner even though they only had one order of ribs and no Navajo Fry Bread.